Heinrich Maier (also Henry Meier) was born in Norka, Russia on July 20, 1859. About 1886, Henry married Efa (also Eva, surname unknown) who was born in Saratov Province on October 5, 1866. Henry and Efa, along with their daughter Emilie (11 months old), arrived in New York on June 4, 1887 aboard the steamship EMS which had sailed from Bremen, Germany. 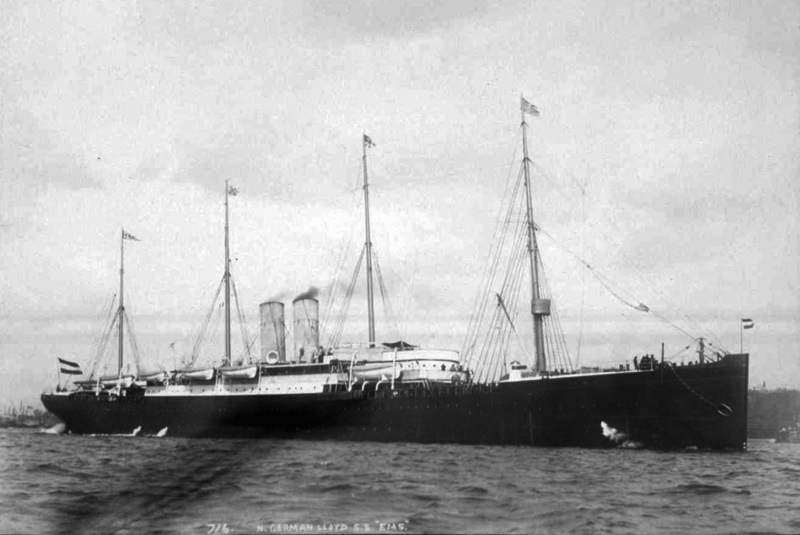 This ship carried several other Volga German families from Norka that came directly to Portland. The North German Lloyd steamship EMS. 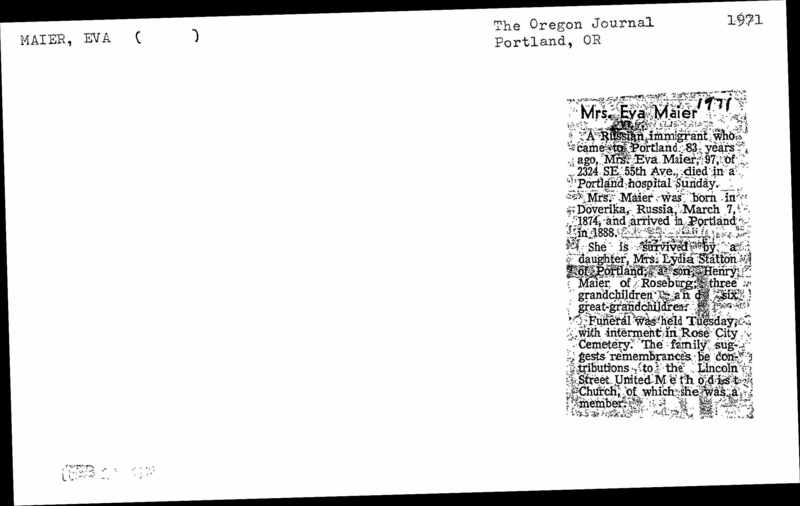 No further records about Emilie have been found and it is presumed that she died at a young age in Portland. Shortly after Henry and Efa's arrival in Portland, a daughter Sara was born on October 21, 1887. In 1891, the Maier's were living on the north side of San Diego street (now Brazee), one lot east of Margareta Avenue (later Union Avenue and now MLK Blvd.). Henry was working as a cabinet maker. On July 20, 1893, another daughter, Frieda was born, followed by Lidia who was born on May 22, 1896. For many years, Henry worked for George Ainslie, who owned Ainslie & Company, a door and sash manufacturing concern. On June 11, 1898, Henry became a Naturalized Citizen of the United States and applied for a passport to return temporarily to Russia. The witness who signed the passport application for Henry was W.R. Townsend, Export Agent for Clarkson & Co. of Vladivostok, East Siberia, Russia. The application was approved on June 21, 1898. Henry was sent to Vladivostok, Siberia on an assignment for Clarkson & Co. to open two sash and door factories. Clarkson & Co. had recently leased 54 acres of land near Vladivostok and was also in the process of constructing a flour mill. Clarkson & Co. also had mining interests and a sawmill in Russia. Clarkson had branch offices in Port Arthur and Harbin, China as well as Nagasaki, Japan. Henry's Russian language skills and knowledge of the sash and door business were put to good use on this assignment. Problems arose in March 1899 when Henry requested documents that would allow him to return to the United States. U.S. Passport records contain a letter dated March 28, 1899 from W.R. Townsend to David J. Hill, Assistant Secretary of State in Washington D.C. The letter is written on behalf of Henry Maier requesting that the State Department issue Henry a passport for his return to the United States. There appears to have been questions about whether or not Henry had lived in the United States prior to his temporary assignment in Russia. 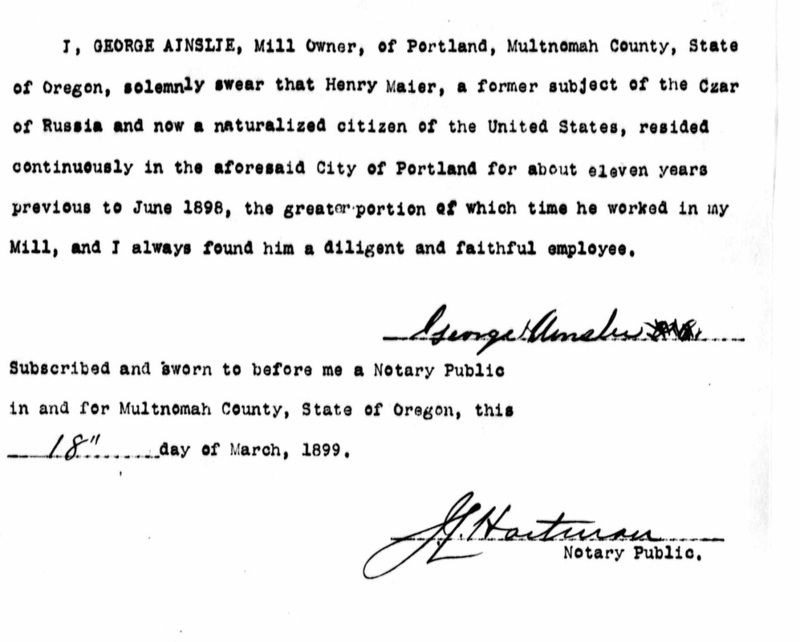 Several affidavits from Henry's previous employers and friends in Portland are included (including his former employer, George Ainslie, and his friend Ludwig Spady). The passport was approved and issued on March, 29 1899. Efa, along with Sara, Frieda and Lidia, traveled to Japan by steamship in June of 1899, in route to reunite with Henry in Vladivostok. Vladivostok was less than a days sailing time from Japan at this time. Efa and the children arrived in Kobe, Japan on July 1, 1899 and then established temporary residence in Nagasaki. Efa and the three children received their passport to return to the United States on July 17, 1899 in Nagasaki. Shortly thereafter, they sailed to Vladivostok to join Henry. Efa was pregnant at the time with Henry Jr., who was born on July 20, 1899 in Vladivostok. Another daughter, Amelia was born in Vladivostok on October 18, 1901. After living in Siberia for over three years, the family returned to the U.S. by way of Yokohama, Japan, arriving in Seattle on September 23, 1902. Frieda and Lidia are not shown on the passport and passenger records documenting the family's return to the United States and it is presumed that they died in Siberia. Efa died of pneumonia on January 17, 1903 at the age of 37. A funeral service was held at the Maier home on Union Avenue on the 19th. Efa was buried the same day at the Lone Fir Pioneer Cemetery (Block 39, Lot 100, Burial Space 1S). 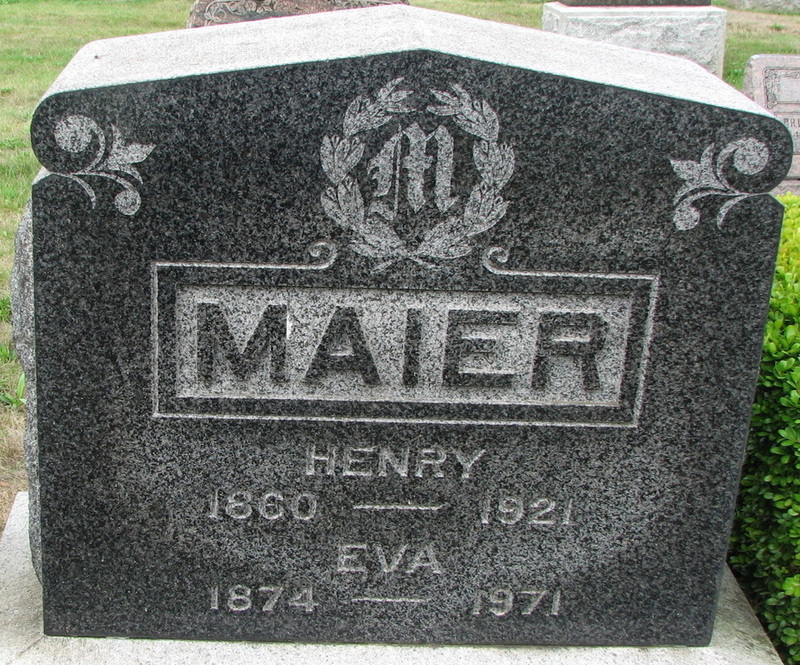 Henry married Eva Metzler on September 16, 1903 in Portland. Eva was born on March 7, 1874 in Dobrinka, Russia. She arrived in the United States in 1887 with her parents Gottfried and Effie Metzler who were close friends of Rev. George Graf, pastor of the Ebenezer German Congregational Church. Henry and Eva celebrated the birth of a daughter, Lydia Eva, who was born in Portland on April 8, 1906. In 1910 and 1920, the Maier family was living at 657 Union Avenue (now 3103 MLK Blvd.) along with three of their children: Henry, Amalia and Lydia. In 1910, a boarder named Leah Meier was also living in the household. Around 1910, Henry became a co-owner, along with Henry Elias Hergert, of the Maier & Hergert Saloon. This establishment was located at Union and Russell. The partnership apparently dissolved by 1912 and the saloon was known simply as Henry Hergert's Saloon and later the Fountain Saloon. The 1914 and 1915 Portland City Directories shows that Henry and Eva owned another saloon at 740 Union Avenue (now about 3500 MLK Blvd.) and they continued to reside at 657 Union Avenue. Henry believed strongly in the benefits of education and sent his daughters to business school and his son, Henry Jr., to the University of Oregon. Henry died on August 3, 1921 and a funeral service was held at the Ebenezer German Congregational Church on NE 7th and Stanton. Henry's second wife, Eva, lived until June 13, 1971. At the time of her death she was a member of the Lincoln Street United Methodist Church. Eva was buried with Henry at the Rose City Cemetery in Portland. Carole Eva Tomlin Rickles, granddaughter of Henry and Eva Maier. Hines, Harvey K. An Illustrated History of the State of Oregon: Containing a History of Oregon from the Earliest Period of Its Discovery to the Present, Together with Glimpses of Its Auspicious Future; Illustrations and Full-page Portraits of Some of Its Eminent Men and Biographical Mention of Many of Its Pioneers and Prominent Citizens of Today. Chicago: Lewis, 1893. 948. Print. Moore, Elinor Allison. "Important Cities of the World." The Intelligence: A Semi-monthly Journal of Education, 24 (1904): 97-98. Print. "Funeral Notices." The Sunday Oregonian [Portland}, January 18, 1903. pg. 12. "Funeral Notices." The Morning Oregonian [Portland], August 5, 1921. pg. 17. Obituary for Eva Maier, The Oregon Journal, June 1971. Lone Fir Cemetery website (April 2016). Last updated November 5, 2017.